You paid several hundreds maybe a couple thousand, dollars for that brand new LCD television. And already there's a fingerprint on the screen! You can't use just anything - that plastic is very easy to scratch	and some cleaning products will attack it and make things much worse than they already are. 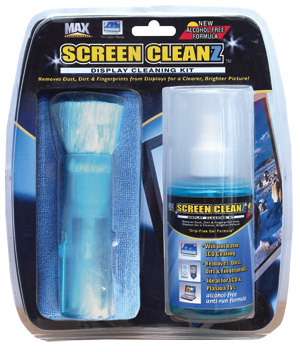 This screen cleaning kit by Max Professional is designed specifically for LCD and plasma televisions and computer monitors. If you have ever tried any other cleaning product out there, then you are aware that most products do not live up to their hype. I, too, have tried numerous products and have always been disappointed. Either the product would leave streaks or some residue behind or it just plain didn't do a good job. But after using this I decided to share my find with the rest of you. As the owner of a television service shop, I have been looking for a product that I could, in good conscience, offer to my customers to clean their sets at home. This is that product! While I can personally testify as to it's effectiveness on LCD and plasma screens, it can also be used for rear projection TV sets, MP3 players, iPods, iPhones and anything else that you wouldn't dream of using standard cleaning solutions on. The kit comes with a 6.76 fluid ounce spray bottle of an alcohol-free, no-run formula cleaner (which is actually pretty large for the minuscule amount that you will use on each application), a microfiber cleaning cloth and a retractable dust brush. Each Kit is only $12.95 plus $7 s&h. Buy more than one kit for a better price on each kit and s&h is still only $7.